-Easy to install using Cat6 connection. -Easily controlled with Master Control Module along with Remote Level Controls. The HDDS SM800 is a wall mountable speaker providing full, high fidelity sound that ISP has become so well known for. The SM800 works excellently for foreground and background music plus music-plus-paging systems. These speakers are ideally suited for a wide variety of applications, from restaurants and specialty retail stores to professional offices and airports. 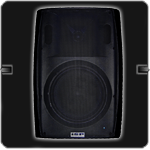 Low frequency output can be augmented with the addition of our HDDS subwoofer, the SB112. Installation of the SM800 is quick and easy, only requiring a single Cat6 cable to be run from the Master Control Module. The loudspeaker is packaged with a bracket for easy wall mounting.